Tax planning and saving for retirement require attention to detail on an ongoing basis. You can easily contribute too much to your Roth IRA if you're not on your toes, but you can fix the problem in one of four ways. All are pretty straightforward—just pick the solution that works best for your goals. Most people can contribute up to $6,000 to a Roth IRA account as of 2019. You can make an additional "catch up" contribution of $1,000 a year for a total of $7,000 if you're age 50 or older. Let's say Sarah is 45 years old and she sees that the $6,000 annual limit applies to her because she's not yet 50. She decides to contribute $600 each month for 10 months from March to December so that by the end of the year, she has maxed out her Roth IRA contributions. Sounds like a great plan, right? Not necessarily. As she's working on her tax return the following spring, Sarah realizes that Roth IRA contributions are also limited based on income—something she was unaware of at the time she was making contributions. A single person's maximum Roth IRA limit begins decreasing when her modified adjusted gross income (MAGI) reaches $122,000 and is ineligible at $137,000 as of 2019. (The limits for those who are married and filing jointly are $193,000 and ineligible $203,000). It turns out that Sarah's MAGI for the year is $137,000. This falls in between the starting point and the end point of the income range where Roth IRA contributions are phased out and eventually eliminated entirely. So Sarah's $6,000 contribution was actually more than what she was allowed to contribute based on her income. So what can she do about the extra money she put in the Roth IRA? A withdrawal is the removal of assets from a retirement account so the amount withdrawn does not count toward a person's contributions for that particular tax year. "For purposes of determining excess contributions, any contribution that is withdrawn on or before the due date (including extensions) for filing your tax return for the year is treated as an amount not contributed. This treatment only applies if any earnings on the contributions are also withdrawn. The earnings are considered earned and received in the year the excess contribution was made." If you've requested an extension of time to file your return, you can withdraw contributions from a Roth IRA up until the October 15 extended deadline. Withdrawals are not treated as distributions. They're like an "undo" function on your computer. It's as if the contribution was never made in the first place. 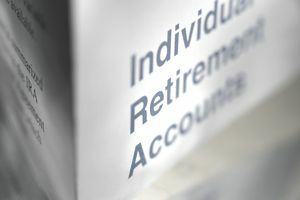 If the amount of money has earned any interest or dividends while it was sitting in the Roth IRA, you must withdraw that income along with the underlying principal. For example, if you are withdrawing $1,000 and that thousand dollars has earned $10 interest, the total amount of your withdrawal would be $1,010—your original contribution plus the earnings on that amount. Your IRA plan administrator knows how to handle this situation because it happens often enough. Try calling first to find out if the plan can help you fix the problem over the phone. The administrator might ask you to submit your request in writing. There's a special rule that lets you withdraw contributions until October 15 even if you don't file for an extension. You can withdraw some or all of your Roth IRA contributions up to six months after the original due date of the return, which would be October 15 for most people. Then, after withdrawing the funds from your Roth IRA, you must file an amended federal tax return. You might also need to amend your state tax return. What if you want to keep your funds invested in the Roth IRA? The IRS lets you apply any contributions that are over the limit toward the following year. Let's say Robert needs to withdraw $1,000 of his Roth IRA contributions because he's over the limit based on his income. "If contributions to your Roth IRA for a year were more than the limit, you can apply the excess contribution in one year to a later year if the contributions for that later year are less than the maximum allowed for that year." "You may be able to treat a contribution made to one type of IRA as having been made to a different type of IRA. This is called re-characterizing the contribution. "To re-characterize a contribution, you generally must have the contribution transferred from the first IRA (the one to which it was made) to the second IRA in a trustee-to-trustee transfer. If the transfer is made by the due date (including extensions) for your tax return for the tax year during which the contribution was made, you can elect to treat the contribution as having been originally made to the second IRA instead of to the first IRA. If you re-characterize your contribution, you must do all three of the following. "Include in the transfer any net income allocable to the contribution. If there was a loss, the net income you must transfer may be a negative amount. Treat the contribution as having been made to the second IRA on the date that it was actually made to the first IRA." There's a special tax just for this situation if you decide to do nothing—an excise tax of 6 percent. It applies to the amount of your contribution that exceeds your limit for the year, and it's calculated and reported on Form 5329. You might think that 6 percent doesn't sound too bad. If the funds can grow faster than that over time, maybe you should just leave the money parked in the Roth IRA. You're right that a 6-percent "fine" wouldn't be too bad if it was just a one-time tax. Unfortunately, it's not a one-time tax. The 6-percent excise tax kicks in each and every year "as long as the excess contributions remain in the IRA," according to a PSA distributed to the press by the IRS. Say Alicia contributed $6,000 to her Roth IRA, but her actual maximum limit was $2,200. Alicia contributed $4,400 more to her Roth IRA than she was permitted to contribute. She didn't correct the excess contribution by October 15. Now Alicia owes a 6-percent excise tax on her excess contribution, or $264. She discovers the error the following spring when she's working on her taxes. She's eligible to contribute $2,200 to her Roth IRA for this new year, and she decides not to make any additional Roth contributions. In this situation, $2,200 of her $4,400 excess contributions is carried over and absorbed into the new year. Her new excess amount drops to $1,100 with a corresponding excise tax of $66. Now let's suppose this same scenario repeats itself again the next year. Alicia's remaining $1,100 excess contribution gets absorbed by the difference between how much new money she contributes to her Roth IRA and her actual Roth IRA contribution limit for that year. In this scenario, Alicia would pay $264 in excise tax over two years. The excess contribution has been corrected by not contributing any new savings to her Roth IRA. By the third year, the excess contribution has been fixed and no additional excise tax would be paid to the IRS. How Much Do Accountants Charge for Tax Preparation?